Assistive technology (AT) can work magic. 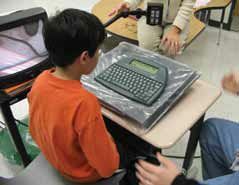 A student at Loudon County Public Schools (LCPS) in Virginia communicated mostly by pointing until the AT team handed him a TechSpeak 32 (www.enablemart.com/Catalog/AMDI-Inc/Tech- Speak). Now he’s able to comment on the environment, ask for what he needs, and make choices using multi-phrase sentences. Teachers of students with visual impairments use AT products to scan documents and turn them into Braille or into digital formats that get read out loud. Other LCPS students use text-to-speech programs to develop their literacy skills. The AT team includes eight full-time trainers, so whenever a student has difficulty, a team member can seek out the right technology. “We started by working with students who had IEPs—that’s our primary mission— but as we’ve done this for 10 years we’ve learned that many of our recommendations are good for all students,” says Christopher Bugaj, one of the AT trainers. Text-to-speech tools, for instance, can help any student edit his or her writing. Nichols admits that professional development is one of the team’s biggest challenges. That’s why they developed a robust website with video tutorials, guides, and resources. The team holds workshops and creates podcasts and DVDs for teachers to watch. Everywhere you turn, there’s an article about how iPads are helping children with autism. Tech & Learning spoke with Katharina Boser, president of Individual Differences in Learning of Howard County, Maryland, and founder of Boser Educational Technologies; and Dan Herlihy, president of Connective Technology Solutions, for tips on using iPads in the classroom. The pair is co-authoring a book called 21st Century Tools for Students with Autism & Related Disorders (Brooks Publishing). • The iPad’s sensory component is crucial. It’s the direct touch of finger to device—rather than using a mouse or stylus—that children with autism appreciate. “Any kind of removal or barrier can cause confusion,” says Boser. • Both experts say that the game-like nature of the iPad creates an environment that is free of fear. “Even if you ‘die’ in a game, you learn why it happened and that removes the anxiety. The games help these children learn about feelings and emotions,” says Boser. • To find the right apps for your students, Herlihy suggests downloading Autism Apps (itunes.apple.com/us/app/ autism-apps/id441600681?mt=8, free on iTunes), a comprehensive list of apps already being used by people with autism. It is divided by category and includes descriptions, reviews, and pricing information. Teresa A. Cherry-Cruz, director of speech language and hearing services for Bridgeport Public Schools (CT), knew vizZle would be a great product for her schools when she saw it at a conference. Produced by Monarch Teaching Technologies, vizZle is a Web-based authoring tool that lets teachers create interactive, visually-supported curriculum customized to the needs of children with autism and other learning challenges. She applied for a grant and received an honorable mention, along with two product licenses for the first half of 2011. The teachers loved the program and were devastated when the licenses ran out. They told Cherry-Cruz that the students with autism responded to the program’s visual nature and were able to retain more information. The teachers especially liked the plethora of pre-made lessons to choose from. Mo Buti, an administrator with the Office of Special Education and Supports Placement, Reintegration, and Special Projects for autism and intellectual disabilities at Chicago Public Schools, is part of a 16-person AT team. She spends most of her time helping teachers find devices that help students communicate and is a big fan of the Web’s free text-to-speech tools. Find more of Buti’s favorites at mobuti.wikispaces.com. Challenge: The number of students with Autism Spectrum Disorder (ASD) has grown to 1 in 110, as estimated by the CDC. Public school systems already hit hard by the economy are looking for cost-effective ways to maintain these students in the least-restrictive environments (as required by IDEA law) and avoid costly out-ofdistrict placements. Solution: The Iowa Education Consortium, Pennsylvania IU 13 Statewide Software Contract, and the Ohio Center for Autism and Low Incidence have all selected vizZle, a visual learning software for autism and special needs from Monarch Teaching Technologies. As a result, schools throughout these states can buy the product at a discounted rate. Challenge: Hopkins County administrators wanted to help increase independence and confidence in content-area classes for their students with special needs. Solution: The district bought 30 classroom sets of Wizcom Technologies, Ltd.’s Reading Pen 2 for its special-ed students in grades 4 through 12. By scanning text with the pens, students can see and hear words spoken aloud in English and can, through text-to-speech technology, also receive definitions, synonyms, spelling and pronunciation. “Students who use the Reading Pens become less dependent on their peers and adults when reading content material, improving schools’ education effectiveness and experience,” says Jennifer Williams Luttrell, Director of Special Education and Early Childhood for Hopkins County Schools. Challenge: Philadelphia’s Special Education Department wanted to empower its teachers to improve academic performance and learn how to personalize the learning experience. Solution: The Department selected Sublime Learning’s eTeachables for Visual Learning and their Inquiry-Based Learning for Interactive Whiteboards libraries to deliver high-quality, just-in-time online professional development videos that focus on integrating the software and hardware available in the district. “We see the great benefit of the cost-effective, easy, and engaging eTeachable libraries as our teachers work to differentiate instruction for our students,” says Russell Washington, Special Education Training Coordinator. Challenge: With budget pressures and chronic shortages of speech language pathologists, educational organizations are seeking alternative options. Challenge: North East Independent School District in San Antonio, Texas, wanted to give general education teachers access to technology training to support all learners. Solution: More than 4,000 faculty and staff will receive training from Atomic Learning to support Universal Design for Learning (UDL) and students in Response to Intervention (RTI) programs. When a general education student is having difficulties or needs special support, teachers will now be able to address them. ABC Cursive Writing: $.99 - Cursive letters written in dots for tracing. Works on fine motor skills, pencil grasp, and correct letter formation. Alphabytes: $1.99 - Four games built into one: tracing the alphabet, writing, spelling, and memorization. Improves fine motor, motor planning. Dexteria: $4.99 - Set of therapeutic hand exercises (not games) that improve fine motor skills and handwriting readiness in children. iWriteWords: $2.99 - Tracing letters and words to help with correct letter formation. Increase visual and fine motor, letter formation, sequencing, and word/letter recognition. Magic Shoes: $1.99 - Tying shoelaces can be a very difficult task for children and young adults who have fine motor weakness. This app offers step-by-step instructions and a video collection. 123 Tracer and More Lite: Free - Number recognition and formation, visual and fine motor skills. Pirate Treasure Hunt: Free - Eight challenges are presented with reading and math skills. Increase visual and fine motor, direction following, sequencing, and visual memory. Sammy-Squirrel Battles the Alphabet Robots: $.99 - Match upper and lower case letters. Works on visual motor and memory, matching, sequencing, fine motor, and visual sequential. Sky Burger: Free - A game that children will love without realizing they are working on visual motor, fine motor coordination of speed, range of motion of wrist, forearms, and more. SuperSearch 60: $.99 - For students 8 years and up. Not only are they playing a game, but also working on their visual motor, fine motor, visual memory, figure ground, scanning and finger isolation. ABC Data: $4.99 - Created to assist professionals and students in Applied Behavior Analysis (ABA), ABC Data is an unobtrusive data collection tool for counting behaviors and recording session duration. EpicWin: $2.99 - It’s a streamlined to-do list, to quickly note down all your everyday tasks, but with a roleplaying spin. So rather than just ticking off your chores and reminders, completing each one earns you XP to improve and develop your character. Everyday Skills: $39.99 - provides self-directed learning sessions for 40 important skills necessary for living independently and accessing the community, Features content developed by the Attainment Company. IDIOM Dictionary: $1.99 - Idioms can be particularly difficult for children on the Spectrum. This online idiom dictionary can help. iPrompts XL: $49.99 - allows you to create picture schedules, a countdown timer, choice prompts. It comes with an image library that includes hundreds of useful illustrations and digital pictures across many categories. iRewardChart: $3.99 - When stars have been earned, your child can pick from the default list of suggested rewards, or you can setup your own custom rewards especially tailored to motivate your children on the ASD spectrum. Practicing Pragmatics Fun Deck: $5.99 - Student looks at an illustration and either reads the prompt or touches the screen to listen to the prompt. After the student gives a verbal response for each answer, tap the green (correct) or red (incorrect) button to score the student. Social Skills Sampler HD: Free - The Conover Company has a wide variety of Life Skill videos. This particular one is designed to teach and reinforce basic social skills critical for independent living. The iPad is loaded with accessibility features, including font size, assistive touch, speak auto text, voice over, speak selection, and zoom. These features are especially important for people who are visually impaired or physically disabled and need more than one tool to access their iPad independently. Following is a list of apps and accessories that will enhance the iPad experience. Big Grips frame: Available for either iPad or iPad 2, the “squishy” Big Grips frame helps keep the iPad from slipping out. Made out of foam, which protects against accidental drops, the Big Grips is non-toxic, lead- and latex-free, PVC free, resistant to oils and chemicals, durable and lightweight. The Big Grips stand can be purchased separately. The frame is $34.95; the frame and stand together is $49.95. BubCap: Does your child keep hitting the home button when working on an app? BupCap prevents this with three different types of caps—offering regular to maximum protection—that cover the home button. The company recommends starting with the Explorer 6-Pack ($6.99), which includes two BubCap (regular), two BubCap Ultra, and two BubCap Max home button covers. iPad Steady Stylus: This T-shaped stylus has a wooden handle with a grip made from transparent rubber wrapped around a wooden stick. The aluminum pointer has a conductive fabric sock plug as the tip. Especially good for people with limited strength in their hands; $40.00. Junior model based on Chewy Tubes available for $16.00. Keyguard: Bumpers to prevent the student from accidental activation of a key. This is especially great for apps such as Proloquo- 2go. Keyguard is $19.95. Mouthstick Stylus: A capacitive touch solution for quadriplegics and people with ALS, MS, or other disabilities that limit use of hands. Customizable stick size can be altered when ordering. It has two working solutions—a fully conductive mouthstick with a Stylus Sock on the tip or a separate Stylus Sock that you can wrap around your own mouthstick—plus a slice of the same conductive fabric that connects the sock to the iPad body; $40.00. Stylus-R-Us: Stylus-R-Us has a wide variety of telescoping styli ranging in price. The average price is around $40.00. BIG Contacts – Large Font for Easier Reading: $.99 - BIG Contacts is for anyone who has trouble reading the default text in the iPhone’s contacts app. The bold condensed Helvetica font is one of the easiest fonts to read. Intellipad: $19.99 - Expensive, but worth it! Offers notepad functionality plus word prediction, text-to-speech, and a customizable keyboard. The Keyboard Editor allows users to merge cells to form larger keys. Choose from an array of colors and color templates that can be applied to the whole keyboard or to select keys. Sign Language Fun Learning for Kids! : $4.99 - Lively and engaging video app includes proper American Sign Language for letters, numbers, animals, family members, transportation modes, nature scenes and salutations, and how to couple facial experessions for higher comperehension. soundAMP R: $4.99 - Using earbuds, hear what you would like to hear. Provides users with clear sound and maximum volume. Record and bookmark lectures, presentations, and interviews, andexport the recordings to your computer. Voice Brief: $2.99 - Personal assistant app that reads just about everything; allows users to customize for news, the weather, calendar and more. Web Reader — text to speech: $1.99 - Uses text-to-speech technology along with Web page content recognition to read Web pages to users. Configure Web pages to be read as soon as they are loaded, read pages manually after they are loaded, or use cut, copy, and paste to read only sections of text. Vicki Windman is a special education teacher at Clarkstown High School South. Read more of Vicki's app recommendations at www.techlearning.com/blogs.